days, they have enough warmth to taste good on chillier evenings, too. In another nod to the cooler days ahead, this salad uses mizuna, one of the Asian greens that does well in cooler weather. 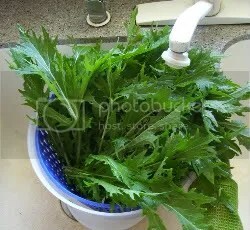 I just had a mild and sweet bunch, but mizuna can be slightly bitter tasting, so try to use it shortly after buying and/or mix it with a sweeter lettuce like red leaf or romaine. 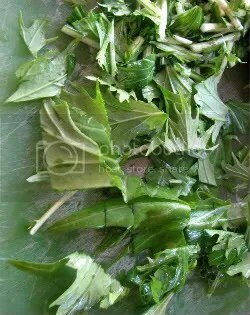 A wilted salad is made by pouring a hot, cooked dressing over the greens, which “wilts” them slightly. 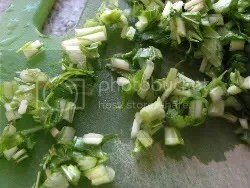 In this recipe, some of the salad vegetables are also sauteed, like the cucumber. I’ve found sauteing to be a good treatment for the cucumbers in my garden that escaped my attention and grew to enormous proportions. If you are working with these kinds of monsters, be sure to peel, then taste both ends and cut off any bitter sections. 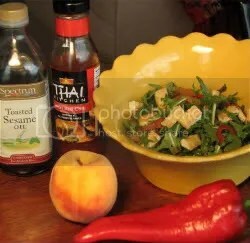 Finally, the salad uses peaches that are just about to fade from the seasonal eating palate, so if you can’t find any, substitute pears which are just coming into season. This salad takes a little time, but it is pretty much a full meal. Just add a little brown basmati rice, whole wheat flat bread or ready made spring rolls on the side for a complete meal. Prepare the Greens (See pictures below) While mizuna is still in a single bunch, hold leafy ends and slice off dried ends of stems and discard. Then slice remaining stems crosswise, about 1/4” thick. Wash, drain and reserve. Slice green tops of mizuna crosswise into 1” strips, then cut opposite direction to get pieces roughly 1 to 2” square (about 6-8 cups.) Wash and dry in salad spinner, then place in salad bowl and toss with peach and mint. Reserve. Marinate Fish Place fish in soup bowl, sprinkle with lime and salt and pepper, then toss to coat evenly. Reserve. Prepare Dressing Combine all ingredients in a small mixing bowl and whisk with a fork until well combined. Reserve. Saute the Toppings In a large saute pan, heat oil over medium heat until hot but not smoking. Add onions and saute 4-5 minutes until lightly browned, turning every couple minutes to prevent burning. Remove to a soup bowl. Saute pepper in same pan about 3-4 minutes, adding a little more oil as needed, then remove to bowl with onion. Add a little more oil to pan, heat and saute cucumber and reserved mizuna stems about 4-5 minutes until lightly browned. Pour hot dressing-vegetable mixture over reserved mizuna and toss gently to coat thoroughly. Salad will wilt slightly. Cook Fish to Top Salad Rinse saute pan used for vegetables, then heat over medium heat until dry. Add oil and heat until quite warm. Add reserved fish and cook just until done. Sprinkle fish over salad and serve immediately. © 2010 Culinary Concepts, Inc.